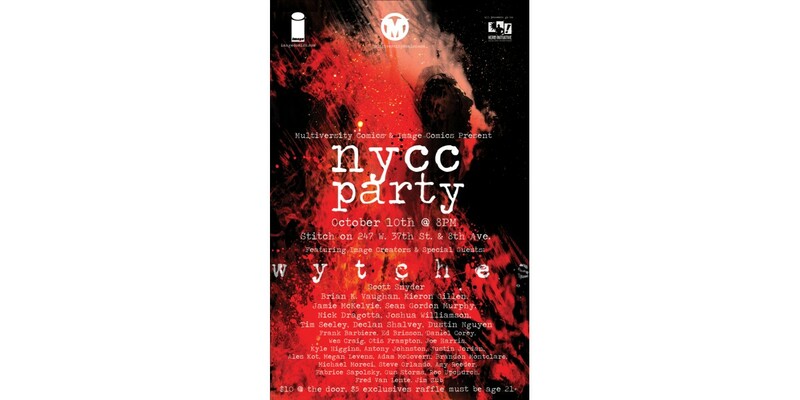 The party will also feature quite a few special Image Comics creators as guests, such as Brian K. Vaughan (SAGA), Kieron Gillen (THE WICKED + THE DIVINE), Jamie McKelvie (THE WICKED + THE DIVINE), Scott Snyder (WYTCHES), Sean Gordon Murphy (TOKYO GHOST), Nick Dragotta (EAST OF WEST), Joshua Williamson (BIRTHRIGHT), Tim Seeley (REVIVAL), Declan Shalvey (INJECTION), Frank Barbiere (FIVE GHOSTS), Ed Brisson (SHELTERED), Daniel Corey (RED CITY), Wes Craig (DEADLY CLASS), Otis Frampton (ODDLY NORMAL), Joe Harris (GREAT PACIFIC), Kyle Higgins (C.O.W.L. ), Antony Johnston (UMBRAL), Justin Jordan (SPREAD), Ales Kot (ZERO), Megan Levens (MADAME FRANKENSTEIN), Adam McGovern (NIGHTWORLD), Brandon Montclare (ROCKET GIRL), Michael Moreci (ROCHE LIMIT), Steve Orlando (UNDERTOW), Amy Reeder (ROCKET GIRL), Fabrice Sapolsky (ONE HIT WONDER), Gus Storms (EGOS), Roc Upchurch (RAT QUEENS), Fred Van Lente (HOWTOONS) and Jim Zub (WAYWARD). So if you’d like to have a drink, groove to some music, share a chat and donate money to a great cause, please join us on Friday, October 10th for the third annual NYCC Party from Image and Multiversity Comics. RSVP on Facebook and we look forward to seeing you there!